Today was our 11 year anniversary! We had NO idea when we married we would end up on this journey. The Lord has been so good to lead us to our 4th child in this way, and on this day. The sisters are incredible women! They work unbelievably hard. I am officially a wimp, as has been inferred to me that all American women are :) Rwandaan women are amazing, working all day with baby #5 strapped to their backs. So, we went to Court with our attorney, Power of Attorney and the Choys. The judge was 7 feet tall. Our attorney, Fidele, was great and looked very snazzy in his robe! Andy got to play lawyer in the court, and thought he was pretty snazzy too! We went to Bourbon Coffee. again. We went back to the orphanage to visit again where we were able to leave Drew in his crib. That was VERY hard. He cried, and I cried, I take comfort in knowing that he will soon be with us. We had an amazing meal for dinner. Evelyn, the Mear's house helper cooked a full meal for us that was traditional Rwandaan food. Caroline is doing great! Today was a VERY long day for her and she was thrilled to be back at the house with her new best friends. We had movie night and everyone slept very well! Thank you all for the encouraging emails and comments, we love to know you all are with us in this! Enjoy this snapshot of our day with Drew! Just bawled my eyes out AGAIN. So full of joy for y'all. Loved seeing EVERYTHING. What a precious little guy. He is beautiful. Loved seeing so many tender moments. Loved seeing him sleeping peacefully in all THREE of your arms. Just sitting here in awe of God's perfect plan for y'all and for Drew. Love the Longhorn jersey. Love your shout out to your Dad, Em!! I know Roger must have smiled BIG when he saw that photograph! Kristin has such a gift....and I am so grateful y'all are sharing it with us (your friends and family) AND with so many out there who are adopting right now or considering adopting!! I hope your day at the Dream Center was fantastic today. Can't wait to hear more from y'all. Keep the updates coming!! 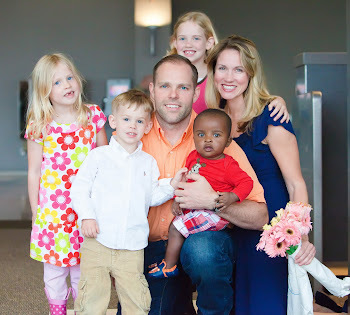 love love love....love seeing his hesitant eyes become more sure...the beautiful plan of adoption! Can't wait to meet him in person! Thank you for posting these pictures. It makes our wait a little easier. I just want to echo everything Natalie and Kristin AND KLTTX said! I loved the big smile we saw as he sat with Andy and how he sleeps with you. And though I hate to hear that you both cried, I love that he already has that attachment to you. Amazing! Perfect!!!! I don't think there is anything else to say, just....Perfect!!! Praying my friends. Love, love, love the updates and pictures. Such a special time...thank you so much for sharing! We are so happy for your family and will continue to pray for you on this journey! Awesome!!!! I'm a Aggie and I love the story of the UT shirt! So fun, to see our friends the Choys in your court pics. Keep posting! I feel like I know your son already! He is just precious. Praying for y'all to be able to hold him and not have to let go. Love y'all. My mom is loving all your posts, too. These videos are awesome!! Thank you for sharing your journey. And a little jealous, as our day seems far away!